Use this the following your own risk! I recently had two Lenovo ThinkPad R61i come my way with the supervisor passwords set. After trying a tonne of stuff on the web I finally stumbled across a solution. There is a lot of information on the web about reading the I2C EEPROMs and reading the scancodes using a program called IBMPass. I managed to read the EEPROM (first using an Arduino Nano, and then using a simple RS232 I2C reader). Alas IBMPass would not provide the correct translations for the scan codes. While messing around I found another solution to the problem: Basically tricking the BIOS into thinking it has no supervisor password and then resetting it. For the first attempt I soldered two leads on to the EEPROM (pins 5 & 6). (For the second machine I just used a scalpel to short the two pins). Boot the machine and press F1. Immediately short the two pins and hold them for a few seconds. The machine will appear to hang while you do this (trying to read the data from the EEPROM and failing). This step should clear the 'user' portion of the password and you should now be able to enter the BIOS (however the Supervisor password is still set). On rebooting and pressing F1 for BIOS and just press 'enter' e.g. blank password and you should be into the BIOS but with the Supervisor Password still set. Select the supervisor password from the menu with the pins shorted. The BIOS setup assumes the password is blank and asks for a new password. Release the short. Enter a blank password twice and press F10 to save. The supervisor password is gone! I'm sorry by I can't remember what the particular chip was. I think it was a P24S08 which is equivalent to a 24RF08, I believe it's the clock and data lines I'm shorting so it can't be read. It's a sort of timing attack. This procedure worked for me for an R61. I was able to remove a supervisor password using this procedure. I had previously removed a power on password (POP) using a procedure from http://www.ja.axxs.net/ . This procedure got me out of having to buy a KeyMaker to remove the SVP! Can this procedure help in clearing poweron password for Lenovo ? Too generic a question I'm afraid. This procedure worked for x61s. Confirming it works with a Lenovo E420. I had to locate the chip: it was called PS08A. I have no words to thank you properly sir, I owe you my life. This works on a Lenovo T61. I was about to give up after trying the method elsewhere on the internet, relating to reading the password from the 24rf08 eeprom chip. I read the 1024 bytes of eeprom data, but the password at 0x338 was garbage. un-typeable. 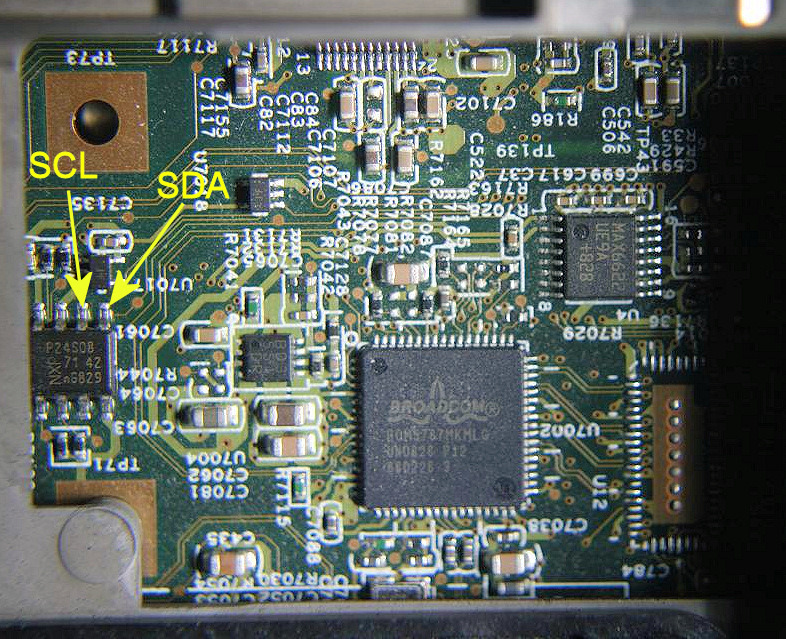 It turns out that if the TPM security chip is turned on, you cannot read the password from the eeprom. Your method of shorting out the SCL and SDA, (pins 5&6) on the 24RF08 chip worked like a charm. Job done in less than 5 minutes, after faffing about with serial ports and terminal software for hours. 1. Keep the pins shorted once from getting into BIOS till you are in menu of changing supervisor password, i.e security -> Passwords -> Supervisior Password and this time it will not ask for old password, will give you only new password option, hit Enter twice then release pins and hit F10 save and you are done, Supervisor password is gone. For T500 and T510, EEPROM are at the bottom side of motherboards, i had to take motherboard out, Parts connected at that time was CPU FAN with heat sink on CPU, Screen cable, Keyboard, RS232 BIOS (Yellow) Battery and Adaptor power cable, it was hard to manage but you can do it. 5 (SI) Serial Data Input To transfer commands, addresses, or data serially into the device. Inputs are latched on the rising edge of the serial clock. 2 (SO) Serial Data Output To transfer data serially out of the device. Data is shifted out on the falling edge of the serial clock. In your step (7), to make the BIOS setup assume the password is blank, please tell me, do I just short pins 5&6 as you do or must I short pins 5,6&2? Thank you. I should have added, the third possibility to have a similar effect to yours with the atmel chip is to short pins 6&2? greg - I would have thought 5&6 would do it. Not at all sure though. Avoid the VCC pin and you'll probably won't brick it whether it works or not. It does not work for my T61. I've tried to find the NXP P24S08 on my motherboard and short the pin 5 and pin6, and then switched on, then pressed F1. It did show some error on the screen, but suddenly the "LOCK" icon show up! How can I solve the problme?! Thanks for your sharing! Thank you a lot! This rescued me really!!! Thought that with cmos reset superviser pass will go, but it locked (password ask even on logon!!!) Everyone to notice: every word in head post is true! Try to read carefully and do as told. The main recipe is to short pins a little longer after F1 pressed while BIOS trying to read the pass from chip, and short pins for a sec when going to change superviser pass - if do right you will see not 3 lines (old and 2 new passes) but only 2 lines with new pass entry!!! Confirmed working on a T40 with the 24RF08 chip. Had to fiddle a bit with the timing of the first short, so for those who are having problems, keep it up. Gracias Amigo...tu fue grande tu ayuda. unbelivable.............. i f*** around the whole day with the serial interface from allservice and got my dump file... used ibmpass and had where the password should be a few weired letters encrypted i guess.......... then i found this here no hardware no nothing just a skalpel to bridge and bamm dude u rock it worked now i get get the 15 TPs back in service i owe u big time !!!!!!! I got this SVP problem after buying a second hand TP W510 and releasing the CMOS-battery. Since then it asks for the SVP. I tried your trick and successfully removed the SVP, set a new one and booted without problems - for 2 or 3 times (everytime he asked for the SVP, although I disabled it after setting it new, but just pressing "enter" was sufficient). After waiting for a few minutes and trying it again, it didn't accept neither "enter" nor the new SVP I had set before. So to cut it short, it does not last with my model. Any new ideas? Besides it shows permanently the data and time error and several other ones. Thanks man. I have about 25-30 T410 and T420 with SVP. First really well written instructions I've found. TY! Nevermind, I just tapped it with a screwdriver (first some tape all around those pins) and it worked! thanks! I just wanted to confirm that this procedure worked for a Lenovo X230 Tablet. wow amazing, it worked on a Lenovo L440. You just did pin 5&6 and no ground? Boot system, press F1, then immediately short 5&6? how long to hold the short? Just tested on a Lenovo X200. I'VE similar problem in my Lenovo L 410 Thinkpad. And having Foxconn DDR3 RAM MOTHERBOARD. But I still not found the EEPROM on mainboard. Plz help me in locating EEPROM or tell me any serial no of EEPROM chip set.